Welcome to our Stamp of the Month Blog Hop! 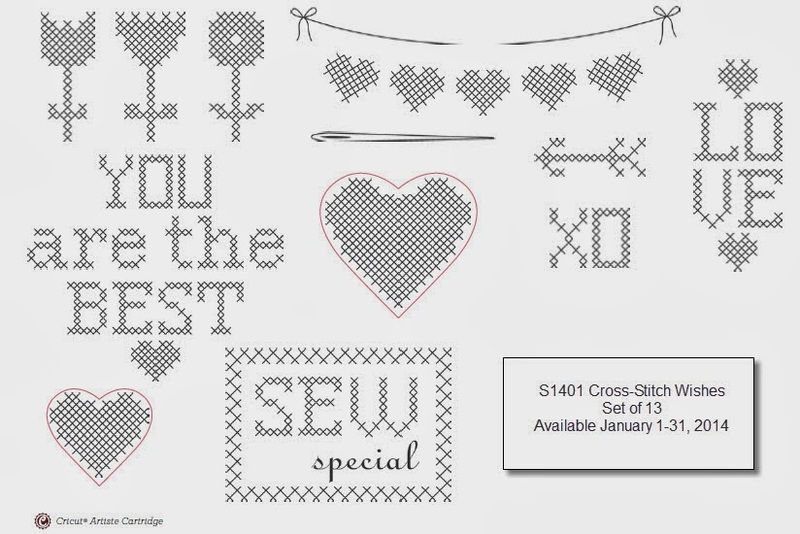 This month we are featuring Cross Stitch Wishes, a set of 13 stamps. If you have come here from Sarita Schraeder's Blog you are on the right path! The blog hop is a great big circle, so you can start here and work your way around. If you get lost along the way, you'll find the complete list of participating consultant's HERE. 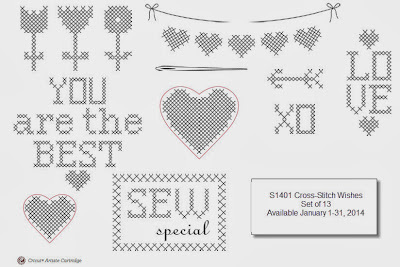 Cross Stitch Wishes is a fun stamp! It's that fastest way to cross stitch that I have found! Just choose a color, ink and stamp! I used to cross stitch alot before I found my new love - scrapbooking and papercrafting. I created two cards using this stamp. I used another 'stitching' stamp - Stitch Wonder (C1564) for the running stitches across the 'quilt' and around the edges of the Colonial White Cardstock piece in the center. I used tone on tone stamping for the hearts and cut them out to 'hang' across the thread. My next card was a little more simple but it still reminds me of a piece of one of my grandmother's quilt. I felt the plain Gypsy cardstock base was just a little too bare so I added the pattern stamping the larger heart and the arrows. I love the little cross-stitched flowers going across the bottom. I stamped them in Gypsy, Lagoon and Outdoor Denim. I added bling from the Blue & Green Sparkles and a tied bow from Outdoor Denim Baker's Twine. I hope you enjoyed these two cards and that they have inspired you to create something too! Now it is time to hop on over to Beth Naumann's Blog to see what she has created for us! National Papercrafting Month Blog Hop! Final Day to order from Holiday Gift Guide! Today is the last day of 2013!! It is also the last chance to order from the Holiday Gift Guide and get these great products! Check out ALL the products from the Holiday Gift Guide HERE and get them before they are gone! Is it just me or has this year FLOWN by?! It seems like just yesterday that I was beginning to think about my daughter's final semester of high school and now she has just completed her first semester of college! One minute I was planning a graduation party and looking forward to Close To My Heart's annual convention and the next minute I'm frantically finishing up my Christmas shopping and getting excited about the new Spring/Summer Idea book arriving at my door on Christmas Eve! That is a total of 127 cards and then there were 16 other additional projects! I participated in many blog challenges this past year and was recognized 9 different times for something I submitted! It's so humbling to have your art recognized especially when there are SO many talented and creative people out there that inspire me everyday. If you would like to see my cards that were recognized, check out my "Recognitions and Achievements" Page. Here is my Happy New Year Card to you all! I created this with the Love Life (D1482) stamp which has been around for a while and it is one I use over and over. So, what is in store 2014? We are actually starting off 2014 with a BANG! With a $35 purchase you can also add the special National Papercrafting Month Cardmaking kit - Cloud 9 for only $15! It's an adorable kit that has everything you need to make 10 cards (2 each of 5 designs) PLUS it includes 3 brand new products coming out in the 2014 Spring/Summer Idea Book! You will be able to read all about on January 1 on my website! Then be sure to come back to my blog on January 4th for a fun Cloud 9 blog hop. Instead of creating 2 each of the 5 designs, I created 5 cards as instructed, and then I created 5 DIFFERENT cards! I'll be sharing those additional cards during the hop! 2014 is going to be an exciting year for those that love Close To My Heart! The new Spring/Summer Idea Book arrived on my door step on Christmas Eve (nice Christmas present for me!) and it has many new products that I just can't wait to share beginning February 1st when the book goes live! I've have some sneak peeks here and there during January so you will want to stay tuned to my blog! I'm planning a big Spring Summer Open House Celebration on February 9th. Watch for more info coming soon! I will continue my monthly StampinHeaven Hostess Clubs. I currently have 4 ongoing clubs but would LOVE to add one more! I will also be continuing my monthly Girl's Night Out that I started in July. This is an opportunity for friends to get together to create something different. I had a variety of projects this past year ranging from Canvas Art, Wreathes, Gift Bags to Jewelry! My first GNO project we will be making Sympathy Cards. If you are like me, we never have any on hand when needed! I love doing parties and I just don't do enough of them! I would love to add at least one party each month! It's always fun to get friends together to create a card and it's even more fun choosing FREE rewards from gathering orders! So - be sure to contact me if you would love to host your own party! I'm so excited about this year's convention which will be taking place the last week of June in Disneyland, California! Close To My Heart will be celebrating their 30 year Anniversary so I'm SURE this convention will be the best yet! That's all for now.... I've got a long list of things to do over the next several days before I go back to work on Thursday! Be sure to stop back by my blog on January 1 to join me on the January Stamp of the Month Blog Hop! It's going to be lots of fun! I've been super busy this last week as I'm sure you all are too. 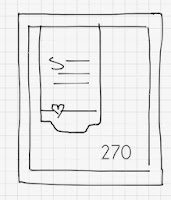 I wanted to make a quick card using the sketch from Retro Sketch before it was too late! So here is my really quick card I created with mostly washi tape! I'm also entering this into the Heart 2 Heart Sparkle & Shine Challenge. I had to take a break from all of the Christmas bustle last night to create a card for my Brother-In-Law. He had surgery yesterday and for the 1st time that I can EVER remember, this will be the first Christmas that my sister and family won't be joining us for the Christmas Holidays. I'm so sad that we will miss them this year but I'm thankful that his surgery went well and now he is on the road to recovery. I wanted to send him a card to let him know that that we were thinking of him! **- Retiring items - available While Supplies Last or until January 31. Quick post here! What a crazy busy week this has been. We are in middle of some kitchen remodeling. Although it is not a MAJOR remodel, it is enough to throw me out of the kitchen! I had planned a vacation day on Friday to do some baking and then realized on Monday I wouldn't be able to be in my kitchen! I had some cookie dough from the previous Saturday's baking day in the freezer that I needed to bake up for this weekend. Thank goodness my husband's office has a really nice kitchen I could use! I loaded up my baking sheets, parchment paper and frozen pre-made cookie dough and headed for my 2nd kitchen to bake! I made good use of my time prepping for an upcoming club night while the cookies were in the oven. I've been itching to get another card made before the weekend so I sneaked into my craft room this morning before heading out to KY for some early family Christmas celebration. Here is my quick card I created using the colors from Pals Paper Arts. I love using non-traditional colors for Christmas. Especially when it involves pink and green! I used the stamp set from the Frosted Cardmaking Workshop On the Go for this card. The sparkles are exclusive to that kit. My colors are Hollyhock and Topiary. The banner on the card was stamped to give it a pattern look. Thanks for stopping by!! I've got an even busier week coming up this next so looks like I'll be trying to find some crafting time here and there when I can! Happy Hump Day Everyone! Here we are sneaking up on Christmas quicker than I am ready for! I don't know about you but I've still got much to do. I haven't spent much time in my craft room lately. Today I'm sharing a card I made on Saturday when it was so bitterly cold outside. 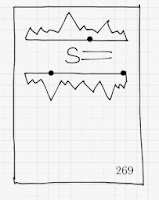 I used the sketch from one of my favorite challenge blogs, Unscripted Sketches for this card. I used paper from the Frosted paper pack for this card. This blue snowflake piece of paper is my favorite out of this whole pack. 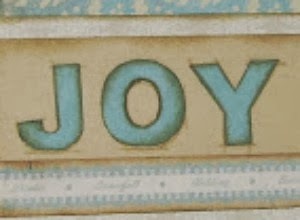 I used Framework Alphabet to stamp the word JOY. I love the line drawn look of this alphabet stamp so in order to keep the drawn lines showing I stamped JOY onto the Champagne Cardstock and then again onto the Frosted Turquoise Cardstock. The Frosted Turquoise letters were cut out and adhered on top of the stamped letters on the Champagne cardstock. Look closely at the picture to the left - you can see the drawn lines. The strip across the front of the card is one of the zip strips from the paper pack. The Mocha Opaques Adhesive Gems creates a more vintage look for this card. These pretty little gems were one of my all time favorite for embellishing and they will be retiring soon! Happy Monday everyone! We had a VERY cold and rainy weekend here in Middle Tennessee. We were lucky that we didn't get the snow and ice that was just an hour north but the rain sure made it pretty miserable. It was a good day for doing a little bit of crafting and baking though! I created a couple of cards on Saturday before I got started on baking cookies! 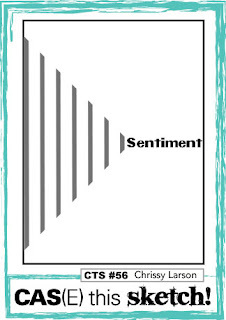 Once I got my shimmer trim on the triangle, I adhered it to the card and added my sentiment. The sentiment is from the stamp set that is exclusive to the Frosted Cardmaking Workshop on the Go kit. This was a great set and I have already used it several times. For my final touch, I added red and green sparkles. Both the Red and Green sparkles were on the While Supplies Last section of my website but now only the Green remain. These are a steal at just $2.00! Each month, Close To My Heart provides a fun download that you can use to create something with. I always look forward to the 1st of each month and can't wait to see what little goodie is waiting for me to download. 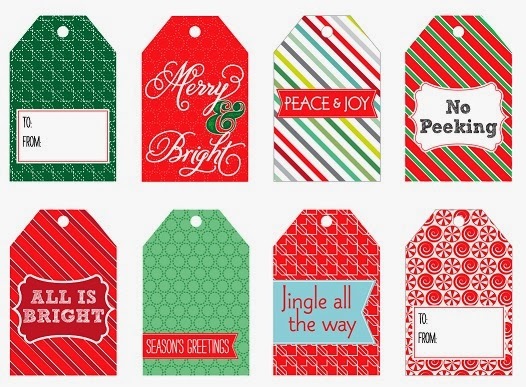 This month it is a sheet full of colorful tags! You can either print them out for some VERY QUICK and easy tags for your gifts, or you can use them in other ways. I decided to use them on some quick cards I wanted to create. I used Sky and Cranberry Cardstock for this card. Look closely and you can see where I used tone on tone stamping with snowflakes on the Cranberry cardstock. I added a sparkle flourish and red bow (retired cranberry ribbon and I was done! I used Sketch #270 from Clean and Simple Stamping for this card. This one was very quick! My next card actually took a bit longer because I wanted to incorporate different patterns and different colors into my card. Once I finally decided on the papers the card came together pretty quick. 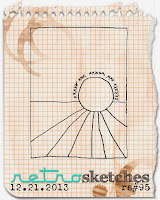 The Sketch from Just Us Girls Challenge blog helped make this an easy card to create. The pattern paper is from the Sparkle & Shine paper pack and I added Cranberry cardstock. The glittery buttons are from the Ruby Mini Medleys which look great with the Red Shimmer Trim. Print out your own tags and have some fun! You can get the download from the Rediscover badge at the top of this blog or from my website under Promotions. Be sure to download and save to your computer so you will always have them! These will only be available for download until December 31 because January 1 will bring us something new! Close To My Heart Website Sale Going On Now! More varieties of Mini Medleys on Sale! More sizes of Kraft envelopes on Sale! More Stickease and Compliments Available on Sale! Many Many more items on Sales! Get them before they are gone! I came across a new challenge that seems like fun and is really a little bit of a challenge. It's over at Pile It On. Every Sunday they post a challenge. But the REAL challenge is to find as many other challenges to enter as you can. Pile It On's challenge on Sunday was to create something with a "P". For this card I created, P is for Pine Trees. 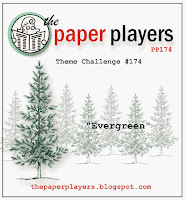 New England Ivy and Olive are usually my 'go to' green inks but this time I pulled out my Ponderosa Pine. This ia a color I rarely use but I really do like it! I used 2nd generation stamping on some of the trees. I wanted my card to be pretty clean and simple but it still needed a little shimmer. (We all could use a little shimmer these days) So I added some Bronze Glitz Glitter Gel to the 1st generation trees. I matted my sentiment with Bronze Glitter Paper and added Mocha Opaque Gems for a finishing touch. The Bronze Glitz Glitter Gel and Opaque Mocha Adhesive Gems will be retiring January 31, 2014! These are just two of my favorite things that will be going away before the new products arrive in February! You can see all the retiring items on my website at www.stampinheaven.ctmh/Retiring Items. These are all While Supplies Last, so if you have any favorites, get them before they are gone! I'm entering this card into 4 challenges!